Origin: The Witch Hunter, Isaac, is a fallen priest left on Earth after the apocalypse. He was seized by the demon-worshiping witches, known as the Willing Damned, who haunt the ruined Earth. They mutilated him, dismembered him, and left him for dead. But he was saved at the last moment by a lone angel who had refused to return to heaven and abandon humanity. 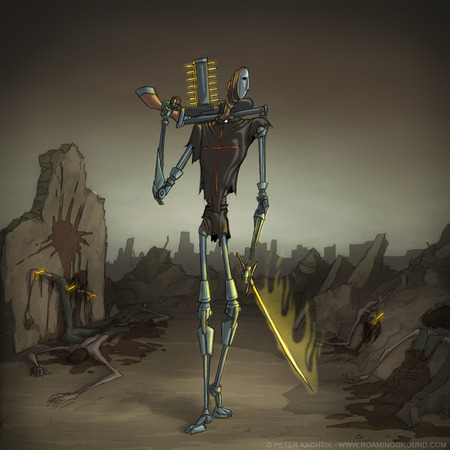 The angel rebuilt his shattered body and sent him out into the wasteland to earn his redemption by defending the last remnants of humanity from the evil forces that threaten to overwhelm it. Appearance: Most of Isaac's body is now covered in metal. His arms and legs are completely mechanical, and much of his torso is held together with metallic implants. He wears a mask to hide his mutilated face. The cloth that wraps him was taken from his priestly vestments, and is worn as a show of defiance to the witches and demons that he fights. He carries two weapons: the first is a gun which fires iron bolts that glow red-hot in the presence of black magic, making them particularly lethal against witches. The other is the flaming sword that the angel who saved him once wielded. As an angelic weapon, this sword can cut through any material on Earth. Unfortunately, demons were once angels too, so many of the weapons they wield and which they arm their human followers with are equally powerful and equally indestructible.